Men at Sea photo (used on front cover) © 2014 Christian Kortum. Wolf Red: Can you say a few words about the instruments you used during the recording of your work on The Exodus Wave? Also a Fractal Audio Axe FX8 was used for some parts. The Marshall 1960A cab was miked with Shure Beta57, SM57 and Audix i5. 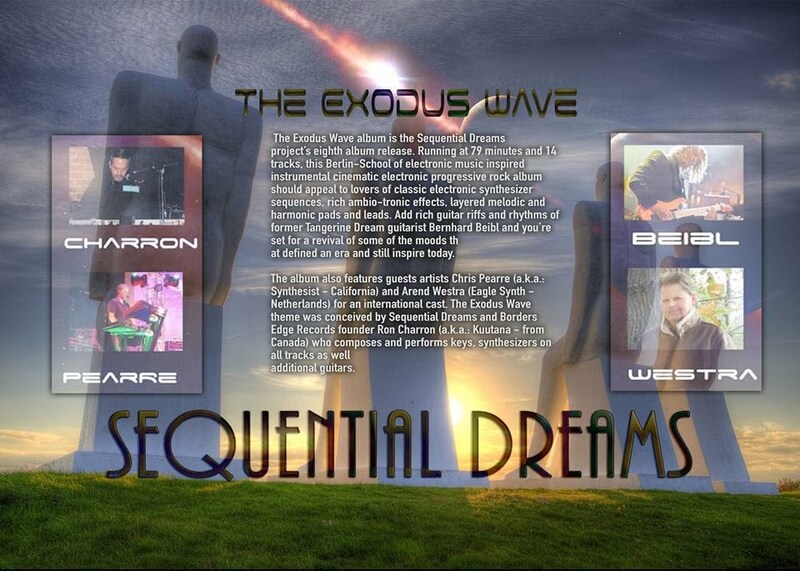 Excerpt from "Telemetry" from the Sequential Dreams "The Exodus Wave"
sound of the previous Sequential Dreams album “Legends” versus the latest album “The Exodus Wave”? BB: The Exodus Wave sounds has a bit more of a space movie soundtrack. There are a lot more soundscapes and sound-FX while Legends was more song-oriented IMHO. So just take a seat on the next spaceship to Mars and make sure to bring your copy of “The Exodus Wave” on board! Wolf Red: Sequential Dreams has often made reference to having some Tangerine Dream influences, musically speaking. Given your own previous experience playing guitar with Tangerine Dream, could you qualify to what extend you feel Sequential Dreams has musical similarities with TD? BB: For sure every electronic band sounds a bit like TD. Some have been more influenced and others less. I think Ron (a.k.a. : Kuutana) is a huge TD fan - so i guess he’s on the “more influenced”-side of the force! And, for sure if you put some tracks played by the guitarist who played 8 years for TD into an electronic music project there might be some little similarities… but no bad ones I hope! To me the sound and the music of Sequential dreams seems a bit more fresh… a bit more modern… that’s why i really enjoy being part of this project for the 2nd time already! Wolf Red: Would you have words to share on how working on Sequential Dreams projects, in such a remote fashion, has been different to you than working on your Tangerine Dream albums in the past? BB: The most special part in working together with Ron is that we never actually met in person. Everything was done via internet. But still it feels like working together with a very good friend who’s just sitting in the other studio room. Only thing missing - the final beer after a recording session. But who knows! I guess we’ll have that in the future! I’m usually totally free playing over songs and even rearranging them. With TD I sometimes brought up some nice solos and then overnight Edgar might have totally cut the solo track and reordered some parts or changed the sound or even sometimes reversed parts of the solo to create some “new” or sometimes “strange” sounds - I didn’t always like that ‘cause I’m still into “pure” rock guitar sounds! I’m very happy that Ron doesn’t change anything what I send him and that he seems to like the pure and honest guitar tone as well! (digital download) and on CD. "Musical ideas converge to make a true synergy. The album has a nice continuity and flow seamlessly from one track to the next!" Wolf Red: Can you say a few words about some of your favorite synthesizers used during the production of the Pleiadian Prophecy track on The Exodus Wave album? Chris: I used a Korg Kronos for the main theme with some Karma scene programming. The Kronos is my main axe and go to synth, an extremely versatile and expressive instrument. The additional tracks are a series of arpegiator tracks with my new Sequential Prophet 6. Rich and fat analog warmness. My first analog synth since the 80's! The first sound you hear is a sample that was manipulated in FL Studio. That sample reminded me of alien sounds. Wolf Red: How do feel about about the sound of the Pleiadian Prophecy track and “The Exodus Wave” album sound as a whole? I love all the tracks and think that Ron (Charron, aka. : Kuutana) is a genius when it comes to blending different musical ideas that converge to make a true synergy. The album has a nice continuity and flow seamlessly from one track to the next! Wolf Red: Your other project work under the project name “Synthesist” also seems to have some tangential inspirations from the Tangerine Dream sound. Can you say a few words about this and other influences? Chris: In the 70's, the sound of Synthesizers emerged changing the nature of how music was created. Early electronic music coming from Europe really bent my ear...Tangerine Dream has always been a major influence and one of my favorites. Tonto's Expanding Head Band, Synergy, Kraftwerk, ELP, Rick Wakeman & Jan Hammer to name a few, have all contributed to the dawn of synthesis by breaking new ground and taking us on journeys unimagined. Wolf Red: The track name "Pleiadian Prophecy" was chosen by you. Can you say a few words to share the inspiration behind the name? Chris: The intro sample sounds alien so I named it Pleiadian (after the Pleiades constellation) and Prophecy to tell an unknown story, unheard by human ears. Wolf Red: There seems to be a renewed interest in synthwave and other synthesizer-heavy types of music with a touch of retro and 80s. What are your thoughts on this? Do your feel your music and that of Sequential Dreams fit into this trend or is it something different? Chris: I remember back when it was all called "electronic music". The 80's were a big boom to bringing synthesizers to the front line versus guitar driven music. I loved all the synth pop hits from the likes of Thomas Dolby, Depeche Mode, Howard Jones, Ultravox and Duran Duran. I call my music electronic but people tend to define it as New Age or Ambient. We have been creating music like this since the 80's so I do not feel that it's a new trend we are following. The game changed in recent years as we all now have home studios with computers, sequencers, midi and multi-timbral synths. Before, we had to pay big bucks to recording studios to over-dub on 16 tracks. Our music is a collection of electronic music ideas Carefully crafted, mixed and mastered by our front man, Ron Charron (a.k.a. : Kuutana). "There was something very dynamic and vibrant to the music"
Wolf Red: The Sequential Dreams project music seems to get a lot of inspiration and influences from the music of Tangerine Dream, especially the 80s and 90s. What are your thoughts behind your focus on this period? Ron: It’s not so much that I don’t like the 70s, and 2000+ period of Tangerine Dream. In fact, I loved Bernhard Beibl’s guitar work so much (TD 2006-2012) that I invited him to join the project! I think it’s that I particularly like the blend of rock music, as best characterized by the judicious use of electric guitars as it was used along with the percussive sequencing and rich layered synthesizer work that Tangerine Dream exhibited during those periods. There was something very dynamic and vibrant to the music during this period. I particularly loved the sound of Exit and White Eagle, and many of the soundtracks produced. However, I also much liked the music produced by TD for albums such as Stratosfear and Rubicon for example. Some other favorites include Sorcerer, but also musically different productions such as Oasis. Wolf Red: For “The Exodus Wave” album, were you trying to recreate some of the sounds of the TD albums you just mentioned? Ron: Not directly. I do find myself occasionally programming my synths to create sounds that remind me of some I loved listening to from TD. I own a number of synth models that were used by TD during the years, and so there have been a number of occasions where I spent dedicated time to approach some of those sounds. 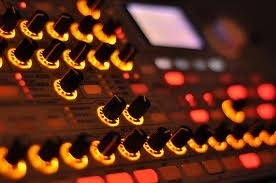 But when it comes to composing the tracks and the music, I simply go with the flow. I go with how I feel. If I had been listening to a given TD album while working on a specific track, there were no doubt stronger influences. I have also spent a lot of time analysing the compositional style of TD. This has certainly given me some direction and guided some of my choices of how I produce the music. Wolf Red: Any other influences? Ron: During the period I was working on The Exodus Wave, the market saw the return of Peter Baumann's "Machine of Desire" album. I spent a lot of time listening to the latest music from one of the early members of Tangerine Dream. The album is dark and very atmospheric. It no doubt had some influence on me. Also, another Tangerine Dream early member to come out with new album was Paul Haslinger. Paul released an album sourced from his soundtrack work for the TV series "Halt and Catch Fire". I really like the album. A great TD sound to it, though it was unfortunately a bit short at 40 minutes. A great "old school" sound to it and as usual, great melodic content. Then on the electronic rock side of things, Bernhard Beibl's 2012 album is a great reference when I work with him - a must listen! Wolf Red: What are your most favorite instruments used during the production of The Exodus Wave? Ron: I really like the Korg Radias synthesizer. 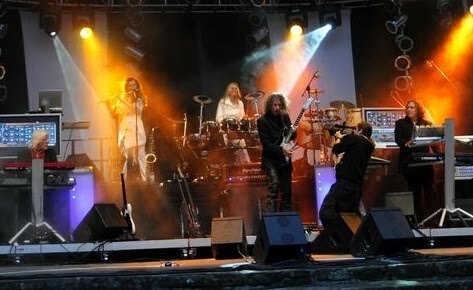 You will notice that both Edgar Froese and Thorsten Quaeshning adorned their rigs with the Radias for several years. The Korg Radias offers a lot of direct access tools that make working on TD-Style music more fun. It has a number of built in sequencers and arpeggiators which offer a lot of direct user control. This is not a preset machine, as I really must say I had to program all the patches I used to get the sound I wanted. But once you get used to it and the workflow, the Radias is a gem. Related, is the Korg M3. Yes, certainly more contemporary synths have encompassed the M3’s capabilities, but I came to a realisation that if I kept spending all my time chasing down and learning new hardware features, I’d be spending less time just programming my own patches on what I had. The M3 captured many of those root waveforms taken the Korg’s historical pedigree, from those staples of the 80s and 90s such as the M1 and the Wavestation, onto incorporating a Radias itself, by using the optional daughterboard. So, I’d say that these two hardware synths, along with an old-time favorite, my Novation Supernova were the workhorses for the album. When i wanted a bit more analog juice, I went an old Korg unit, the X911 which i could control through my guitar. I also occasionally used some Dave Smith synths for analog. For convenience, I also am a heavy user of the Korg Legacy suite of plug-ins, where i tap into the sound of the Polysix, and Monopoly on occasion. On the software side, I also like to complement with Omnisphere, and several synths from the Native Instrument Komplete series. However, a notable set of software synths used on this album came from a Montreal-based virtual instrument producer, Applied Acoustic System by way of their UltraAnalog and Tassman synths. Wolf Red: You also played guitars on this album? Yes, that’s right. Bernhard Beibl plays guitars on the first 3 tracks and the 1oth (Telemetry, Subspace Breach, Pleiadian Prophecy, and Booster Separation). Certainly those are the big highlights of the album when it comes to guitar play! But on some of those I also contributed some complementary guitar, mostly in intro or outro sections. I also played all guitars which show up on several of the remaining 10 album tracks (Ed. note: the album has 14 tracks). This includes acoustic, electric guitars but also a mix of eGuitars played either via keyboard or using my specially adapted guitar synth rigs hooked up to a real guitar. Wolf Red: Can you talk a bit about your work with other Sequential Dreams project contributors on this album? The Exodus Wave marks my 5th collaboration with California-based Chris Pearre (aka. : Synthesist). Chris is a pleasure to work with, and his contributions generally come from an initial base track that Chris produces, mixes down into separate tracks and sends to me. I then weave in additional sections and also layers onto his work. Chris has been a real sport in letting me do some rearrangements. There is a special vitality to Chris’ work and I much enjoy working with him. I think it shows in the “Pleiadian Prophecy” track on The Exodus Wave album. This will be the first time I work with Arend Westra. I have much enjoyed listening to his work on his Eagle synth projects, and I felt a certain musical affinity. I was glad he accepted my proposition to work on The Exodus Wave album. The track “Booster Separation” which I named because of how the sound of the track eventually evolved and the mental imagery that formed as I placed it against the backdrop of the storyline I had formed for the album. I added layers of synths and sequences to Arend’s initially contributed base track, which now form the intro and outro of “Booster Separation”. I also added a middle section which was primarily intended to provide a base track for Bernhard Beibl to lay down his guitar tracks. Collectively, we worked through several iterations of ideas on how to shape the track. In the end, it sounded very differently than what I had imagined at first, but came out as a gem. The Exodus Wave album marks the second of my album collaborations with former Tangerine Dream guitarist Bernhard Beibl. Berni was very busy doing concerts and preparing for a retreat to India during the time we worked on the album. But I was pleasantly surprised by the amount of time and focused attention when working on the tracks. Berni has a very strong sense of what he likes, and is, of course, a very skilled guitarist and musician altogether. There are tracks (eg. : first two album tracks) where Berni’s added guitar fitted hand-in-glove into the mix. In the case of Booster Separation and Pleiadian Prophecy, we went through many trial and error cycles, trying out ideas, mixing them down, sending them to each other across the Atlantic Ocean by way of the file transfers. It is arduous work, and there are many times where direct proximity would have accelerated the work. But on the other side, the distance separation and the work over longer periods of time also allowed for periods of reflection and reworking of the tracks, to eventually converge on consensus of the final product. I continuously learn from working with Berni and his guitars bring an irreplaceable energy and vitality to the album! Wolf Red: What is the story behind “The Exodus Wave” theme? Some listeners who follow my work on multiple projects will know that I have an interest in Sci Fi and like to dabble in writing short stories. This was particularly evident on my “The Roboter - The Motoko Files Cyber Prophecy” project where I actually wrote a short story and produced an audio book with the album music as incidental and background music. In the case of the Sequential Dreams “The Exodus Wave” album, i didn’t move on to writing the short story but I did have one evolve from initial concept, through the various “chapters” onto the conclusion. For this project however, the chapters took shape in the titles and in the mental story I created for myself and which shaped the music itself. The premise is that of a catastrophic celestial event: The incursion of an alternate universe onto our own. It’s manifestation came in the form of disruptions in space and time which formed a massive quasar. As one can learn from space science, if you are on the wrong end of a quasar, your planet, solar system, and many light years around face extinction due to the directed high energy output. Hence, if you read the track names in sequence, we start with the first track called “Telemetry”. This is a scene where a remote sensing satellite detects the event. “Subspace Breach” is the first point of observation of the incursion into our universe. As we move forward into the album, we see the title “Wavefront” which is the imminent energetic manifestation of impending disaster for our planet. So the middle section of the album is about humankind’s reaction to this catastrophic news. That is the creation of Space Arks (or ships) to carry some survivors away and onto a distant new Earth. Although it may appear rather gloomy, then end story is relocation and rebirth. Wolf Red: So it’s this storyline that is behind the pervasive cinematic and fx driven track intros in this album? Yes, exactly. I wanted to create that sense of imminent danger as the story unfolds. Then come the heroic acts to try to save a part of the population. Then we move into a stage where the journey through space begins, leading to the new world. Wolf Red: Can you tell me more about the Album cover image? The choice of the album cover was inspired by a Berlin based photographer I had worked with on a previous album (Aquatic Dreams). Silva Wischeropp has published a photo she took during a trip to Denmark of the "Men at Sea" statues. I had never seen those before, and thought these were perfect! But I also had this picture in mind of people on Earth looking up at the skies onto the imminent destiny of the incoming wavefront. So, it turns out I found another photographer ( Christian Kortum ) had taken a photo of the Men at Sea from an angle where they were looking up towards the sky. This was perfect! With his permission, I photoshopped in a NASA artwork of such an imminent space disaster to fill the sky as the Men at Sea look up to it. But I still loved Silva's photo so much that I used it as the back cover of the CD. I’ve always hoped to get an opportunity to work on the score of a Sci Fi movie. Perhaps I will get the opportunity some day. In the meantime, I create my own virtual movies, and add real music as soundtracks! Wolf Red: The Exodus Wave album is the first time you seem to be using your birth name? Yes, that’s right. I initially started publishing albums, years ago on a project I called Kuutana. At the time, I was heavily into practicing traditional martial arts, and I had considered using the name “Katana” (a Japanese sword). That name was already taken so I thought of working around the theme. The music I was working on at the time was very ambient. I started thinking of a “guiding spirit” as my theme. For me, that was the Moon. The work “Kuu” stands for Moon in Finland. I then grafted “tana” (remember “katana”). So conceptually, the project name was “Moonsword” but crafted in the way I just mentioned. So, when I created a user account for Kuutana (on Facebook) they required a last name (Pages weren’t quite there back then). So I took the name of my first album as Kuutana, that is “Serenity”. Hence, “Kuutana Serenity” was born and was (and still) used by many today. I decided to just go along with that, for a number of years, including using Kuutana as the artist name in contributions to Sequential Dreams projects. But after a while, it came to mind that there was a very marked difference in both sound and communities for these different projects. So I decided to “come out” and simply use my birth name for new Sequential Dreams projects. Wolf Red: Where to next for Sequential Dreams? Then there is the business side of things. My first six albums were published as digital download albums only. This was primarily for practical financial reasons. I don’t like to produce a product knowing it will always be in the red, financially speaking. But I moved into the seventh album (Legends) I thought I would give a go at self-financing a CD run. I carried this forward to the current “The Exodus Wave” album which will still be available as digital downloads through most major outlets as usual, but will also have CDs available through CD Baby and Amazon. Also, for a first time, I exploring developing a relationship with a web-store called Ricochet Dream, which has an extensive catalog of CDs which appeal to Tangerine Dream listeners. Wolf Red: Any final words? The production of Sequential Dreams albums is a labor of love for me. I love composing, performing, arranging, and producing the music. It lets me travel to space (even if only innerspace) without the exorbitant cost of actual space travel (laugh). I love to produce albums that I love to listen to. So I am my first customer. I like to produce music that makes me feel good and makes me feel like the world is bigger and more magical. I got this feeling from producing “The Exodus Wave” album. I sincerely hope that listeners will enjoy listening to it as much as I do!